One of the most influential British indie bands, propelled from the musical tinderbox of early 80s Manchester and the 'Madchester' movement of the 90s into an enduring global career spanning over 30 years with hit after hit including Sit Down, She's A Star, Laid, and Getting Away With It and over 20 UK Top 40 singles and selling millions of albums worldwide. On top at the midway stage of the chart week, their latest studio album Girl at the End of the World recently came close to knocking Adele's 25 off the prized number 1 spot of the UK album chart. 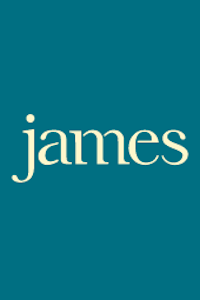 James website. James are one of the UK's most creatively restless and loved artists. Known for their unique and diverse style over their 13 studio albums, they're both critically acclaimed and commercially successful, having sold over 12 million albums worldwide. The band originally signed to the iconic Factory Records in 1982, and have since gone onto produce a string of massive hit singles, including: Sit Down, Come Home, She's A Star and Born of Frustration. Now, 32 years on they have come up with a record that the band consider their best ever. Girl At The End Of The World sees the band team with producer Max Dingel (The Killers, Muse, White Lies) with the legendary Brian Eno infusing his unique influence into the blend. The new album is both anthemic and euphoric, with it's simmering electronica continuing James' long connection to the dance floor. The band's trademark songwriting and Tim Booth's distinctive vocal & evocative lyrics prove once again to be amongst Britain's finest. Group/Band Echo and the Bunnymen. The Manchester band have sold more than 20 million albums worldwide and will be performing songs from their extensive back catalogue - interpreted for these unique shows by the 22 piece Orchestra Of The Swan and 16 piece choir from the Manchester Consort each conducted by classical composer/conductor Joe Duddell. The concerts will see James' back catalogue re-imagined for orchestra and choir, with the band playing many songs they haven t performed for years.Group/Band The Orchestra of the Swan. Group/Band Manchester Consort Choir. Wtih 10 studio albums, twenty UK Top 40 singles, 12 million albums sold and worldwide touring success, their Mini album 'The Night Before' is due out in April 2010. Performer James. Performer Ben Folds. Group/Band Turin Brakes.